Badminton powerhouse Indonesia will bid farewell to two of their women badminton greats of present era - Liliyana Natsir and Debby Susanto - after the on-going USD350,000 Daihatsu Indonesia Masters in Jakarta. 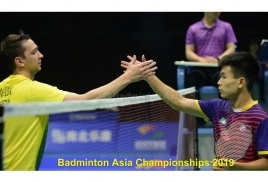 Liliyana, especially, will be sorely missed, having given 17 years of her 24-year badminton career to the Indonesian national team- sweeping all the badminton "majors' along the way. The 33-year-old who hails from Manado in Central Java, is a four-time mixed doubles world champion. She partnered Nova Widianto to win in 2005 (Anaheim) and 2007 (Kuala Lumpur). With Tontowi Ahmad, who is her current mixed doubles partner, Liliyana added two more world titles and this was in Guangzhou (2013) and Glasgow (2017). The duo also completed a hat-trick of wins in the mixed doubles in the prestigious All-England, winning it in 2012, 2013 and 2014. However, nothing beats the Rio de Janeiro Olympics in 2016 gold medal and wrote Indonesian badminton history as the country's first mixed doubles Olympics gold medal winners. The pair won the silver at the 2008 Olympiad in Beijing. Liliyana also has several Sea Games gold medals in her cabinet - winning the mixed doubles gold in Manila (2005), the women's doubles and team gold in 2007 (Korat), mixed doubles gold in Laos (2009) and Jakarta (2011). At the Asian level she struck gold in Johor Bahru, Malaysia (2006) and Wuhan, China (2015). "I have been in the game for more than two decades and donned the national colours for a good 17 years. Although sad but it is time to move on to other things and spend more time with my family," says Liliyana. won the All-England mixed doubles with Praveen Jordan in 2016. The Palembang-born also won the Sea Games gold in 2013 in Myanmar and in Singapore in 2015. At the Daihatsu Indonesia Masters it has been a mixed run for Lilyana and Debby. While Liliyana-Tontowi stayed on course after defeating India's Pranaav Jerry Chopra-N. Sikki Reddy 21-15, 21-13 in the first round, Debby and partner Ronald Ronald crashed out - losing 15-21, 13-21 to Germany's Mark Lamsfuss-Isabel Herttrich.